There's been a lot of buzz in the bike industry about ceramic bearings in the past few years, maybe more buzz than any other new product. Let's face it, the allure of going faster with less energy is appealing to almost anyone. On the other hand, you can pay a lot for that free speed, and those on a budget will find themselves weighing whether the speed and efficiency gains are worth the cash layout. The first thing to ask is where the speed advantage comes from. It comes from reduced rolling resistance, increased durability, increased stiffness and reduced weight. Rolling resistance is reduced because the balls are generally ground smoother, rounder and more uniform in size than steel, so they are each carrying close to the same load, rather than larger balls carrying more than smaller ones within the same set. And unlike aerodynamic friction, which becomes more of a drag as riding speed increases, mechanical friction is linear. Because ceramic bearings are harder than steel bearings, they are more durable, lasting anywhere from five to 20 times longer. This also equals an almost zero risk of bearing seizure. Consequently, since they also do not rust, they are less sensitive to moisture and lubrication, and some even come with no lubricant at all. Ceramic balls and races are also stiffer than steel ones, resulting in less flex in the bottom bracket. Finally, ceramic bearings are lighter, because ceramic is less dense than steel (silicon nitride, for instance, has a 60 percent lower density than steel). When combined with special seals and optimized lubrication, the friction in ceramic bearings can be 20- to 30-times lower than steel bearings with standard seals and lubrication. All ceramic bearings are not created equal. Just as there are various ABEC grades of steel bearings that rate smoothness and rolling resistance, a similar rating system applies to ceramic bearings. There are two types ceramic bearings—hybrid ceramic bearings and full ceramic bearings. Within those categories there are gradations based on smoothness of both the balls and the races, and in the uniformity of size. Hybrid ceramic bearings have steel races and ceramic balls. They are a bit lighter than steel bearings only because of the weight difference in the balls alone. They roll a bit faster than even the best steel bearings because the balls are smoother, harder, rounder, and more uniform in size, and the steel races are often ground smoother as well. 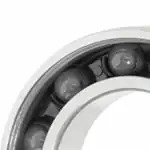 The friction in a typical bearing with silicon nitride balls and steel rings is about 10 percent less than in an all-steel bearing of the highest quality. Full ceramic bearings have both ceramic balls and races. They are lighter, due to the ceramic rings in which the balls ride. They roll faster due to smoother bearing races, and they are more durable and less sensitive to moisture and require little, or no, lubrication. The bearings do not have to be cartridge bearings, either. As many Shimano, Campagnolo and Fulcrum hubs and Campagnolo headsets and jockey wheels (as well as many older hubs, bottom brackets and headsets) use a cup and cone system instead of a plug-in cartridge, ceramic balls can be obtained for them. Different types of ceramics are used in bearings. Silicon nitride, Si3N4, and Zirconia, ZrO2, are perhaps the most common ceramics used in bearings, but there are many ceramics that would work well in this application. There are also different grades of both hybrid and full-ceramic bearings, based on smoothness and uniformity of the balls and races, and a ceramic bearing also has an ABEC rating reflecting these characteristics. There are also different levels of seals available. All of these variations result in differing prices. And of course, price is also a function of supply and demand, and the demand among cyclists has been quite high lately.